Italy and China vowed joint efforts to strengthen their cooperation on digital economy, digital silk road and tourism, following the launch of a task force aimed to position Italy as a leading country in Europe vis-à-vis China-proposed Belt and Road Initiative (BRI) and Beijing’s “Made in China 2025” industrial policy. The pledge came out of a high-level event gathering both senior officials and business representatives, which took place on 25 October at the Chinese Embassy in Italy and organized by ChinaEU in the context of the Diplomacy Festival- a week-long of events annually supported by the Italian Ministry of Foreign Affairs. 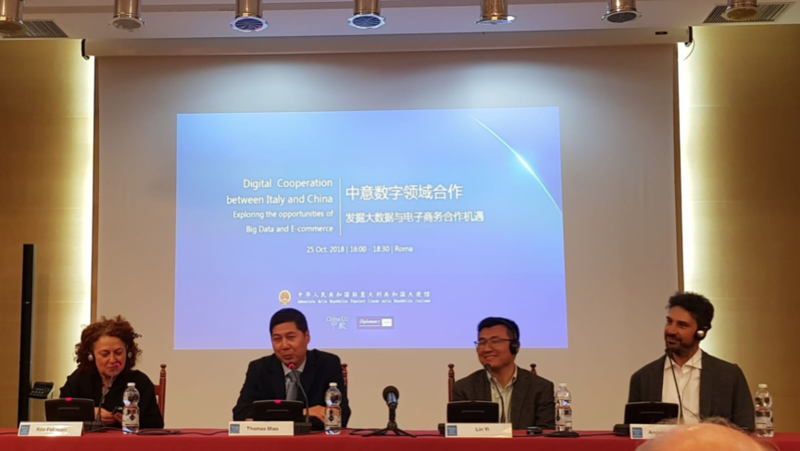 The event, themed “Digital Cooperation between Italy and China – Exploring the Opportunities of Big Data and E-Commerce,” was presented by Chinese Ambassador to Italy Li Ruiyu, Italian Economic Development Undersecretary Michele Geraci, as well as representatives of Italian and Chinese businesses, including Huawei, Tencent, Bvlgari and Scooterino. Ambassador Li addressed a keynote speech and said, while China’s economy is transitioning from a phase of rapid growth to a stage of high-quality development, it is the country’s important missions and tasks to develop digital economy and explore new momentum of growth. Beijing has, in recent years, introduced a number of strategic plans such as “Internet Plus” and “Made in China 2025” to effectively play the role of innovation in information technology and make Chinese industries more digital and intelligent. “Booming Chinese digital economy shows outstanding features such as rapid industrial development, large consumer market, great investment in innovation and sound policy environment,” Li said. “If you want to go fast, walk alone; and if you want to go far, walk together,” the Ambassador quoted an African proverb and expressed the hope that China and Italy will work together in developing a digital silk road. As both China and Italy are active promoters and contributors to technological innovation and the digital economy, they should further synergize digital innovation and jointly build a digital silk road, the Ambassador said, adding that the two sides should unleash potential in e-commerce to facilitate high-quality growth of bilateral trade and promote tourism cooperation. Italy and China have worked to strengthen their relations via the ambitious BRI, initiated by Chinese President Xi Jinping in 2013 and seeking to revive the ancient Silk Road trade routes to link China with other countries in Asia, Africa and Europe through building a trade and infrastructure network. Rome inaugurated a China Task Force at the beginning of October in a bid to secure Italy’s leading position as China’s European partner in BRI and thus gain more access to the world’s largest market and lure more Chinese investment. 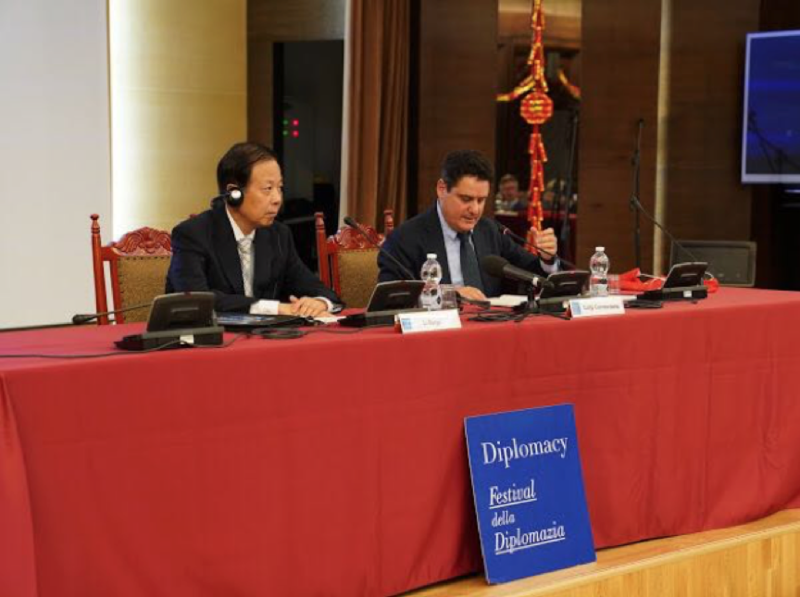 The China task force was initiated by Italy’s Deputy Prime Minister and Minister for Economic Development Luigi Di Maio and Undersecretary Michele Geraci, who spent 10 years in China. The move came following a boom in trade and investment relations. Last year, the bilateral trade increased by 15.1 percent while Italian exports to China surged by 22.2 percent, surpassing Chinese exports to Italy. As to 2017, Chinese investments to Italy hit more than 12.5 billion euros while Italian investment to China reached more than 7 billion U.S. dollars. Meanwhile, an increasing number of Chinese tourists pay visits to Italy. Data showed that more than 1.5 million Chinese visited Italy in 2017. Every year, Chinese customers account for 30 percent of tax-free sales in Italy. China’s advantages in the digital economy are evident and the prospects for strengthening cooperation in related fields are broad, said Geraci. 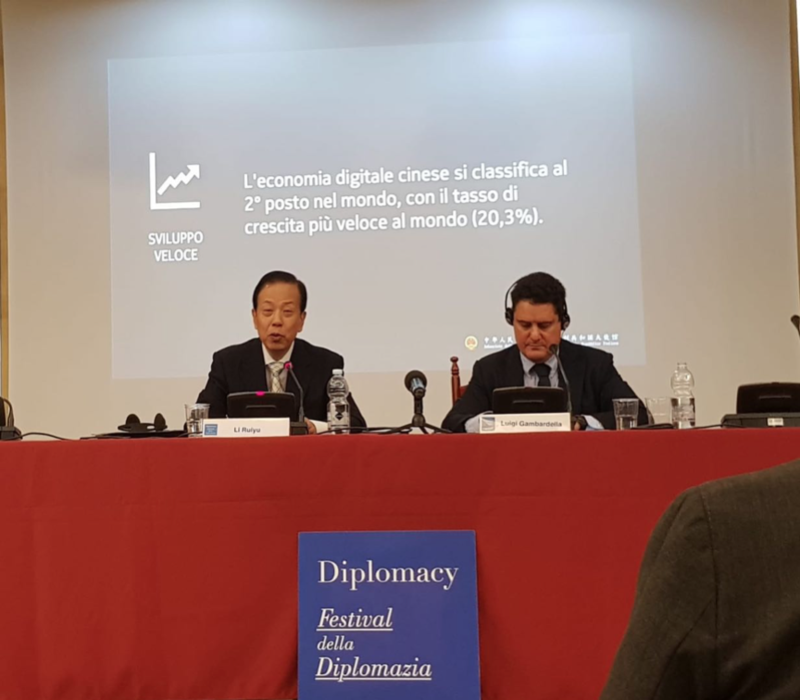 He told the audience that the Italian government has unveiled a plan for digital economic revitalization including expanding e-commerce, developing mobile payments and improving logistics systems. Geraci vowed Italy to work with China to promote digital exchanges and cooperation, help start-ups from both countries learn from each other and expand tourism cooperation. “A digital silk road is a significant part of BRI. 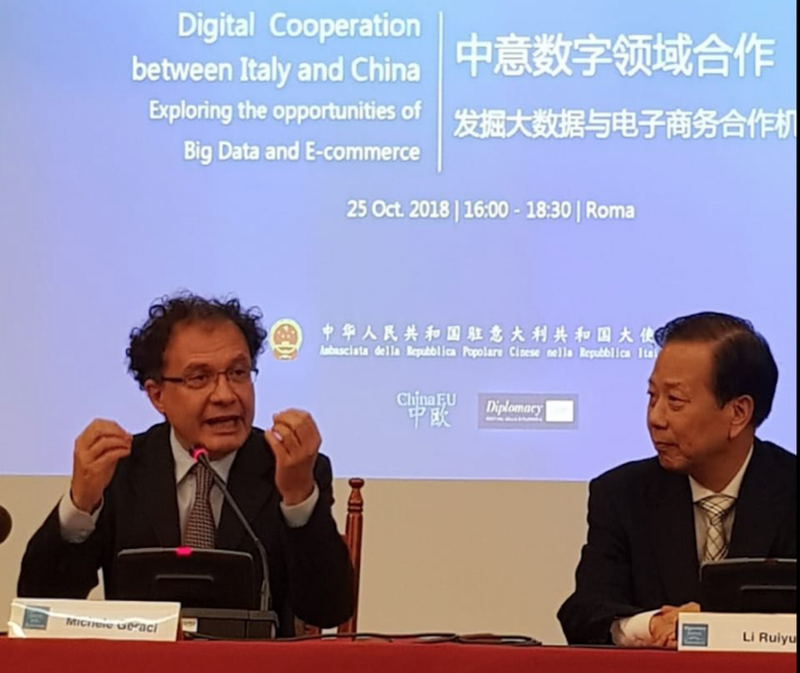 As Italian and Chinese governments decided to work together on BRI, the digital cooperation should be highlighted, ” said Luigi Gambardella, president of ChinaEU. As Italy is upgrading its manufacturing sector and promoting digital development, the digital cooperation with China will pose bright and win-win future for Rome and Beijing, Luigi Gambardella noted. Business executives and representatives later discussed opportunities brought by China’s digital sector, particularly in areas such as big data and e-commerce. China, with the largest number of internet users and mobile phone users in the world, stands at the world’s largest e-commerce market and is widely recognized one of the top players in big data. Italy, the third largest economy in the 19-country Euro area, has witnessed stronger presence of Chinese companies including telecom giant Huawei. 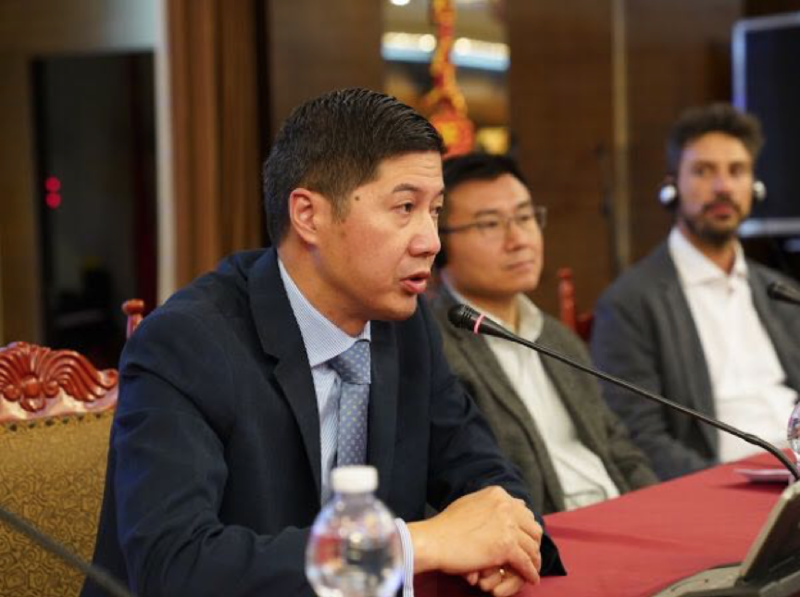 Thomas Miao, CEO of Huawei Italy, said, the company is highly invested in building strong partnerships with the local industry and community. As part of these efforts, Huawei encourages young Italian talents who want to experience Chinese culture and learn ICT skills to join its global program “Seeds for the Future”, in the company’s headquarters in Shenzhen. 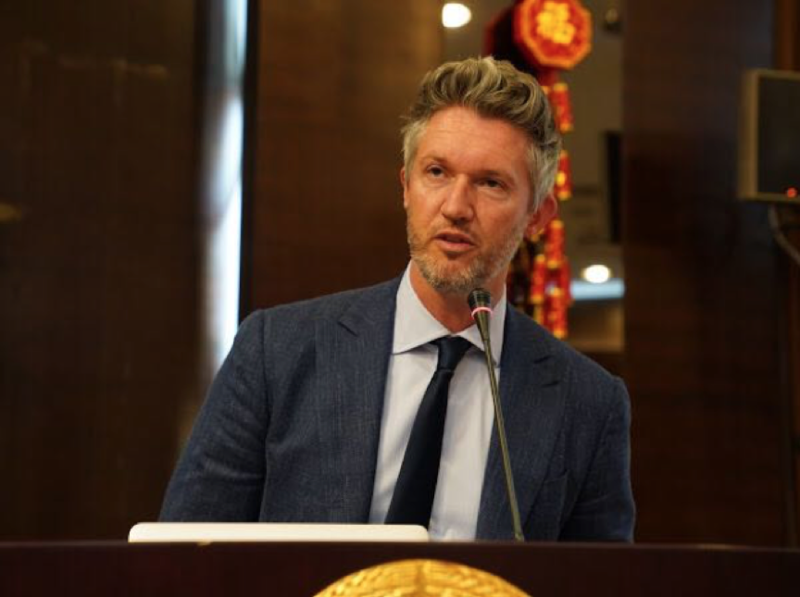 Angelo Coletta, President Italia Startup, said, that China’s digital and tech market represents an enormous opportunity for those Italian startups who are ready to grow internationally. South China’s Shenzhen city, China’s Silicon Valley, has set up a representative office in Europe to promote China-Europe economic, trade and investment ties. Lin Yi, the office’s chief representative, said the city welcomes foreign companies to be part of its rapid technological development and fosters exchanges between Chinese and Italian startup ecosystems. Shenzhen-based tech giant Tencent is seeking to expand influence in Europe. Andrea Ghizzoni, Director Europe of Tencent, explained that, over the past couple of years, Italian businesses have well understood the potential of WeChat – China’s home-grown social media with 1 billion monthly active users – as a reliable and affordable digital channel to access and interact with China’s growing middle class consumers. Arno Reijm, Chief Marketing Officer at WeGoEU, a joint venture between Dutch telecom company KPN and Sunway Group, presented the audience a flagship WeChat mini-program “WeChat Go Europe” (乐游欧洲), a sub-application within the WeChat ecosystem functioning as the one-stop shop virtual travel companion for Chinese tourists in Europe. 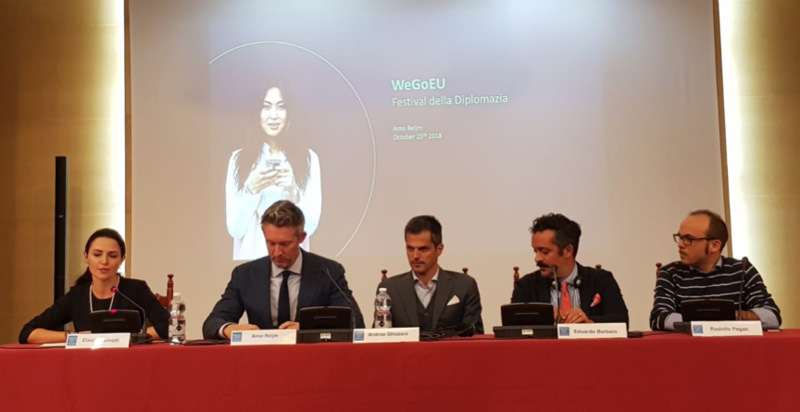 WeGoEU provides advanced features to Chinese users including geo-localization, booking service, coupons, mobile payments, etc, and has successfully facilitated thousands of Chinese visitors’ stay in Europe, he said. Positioning Italy as one of the top destinations in Europe among Chinese tourists is also one of the goals of Italy’s new China task force, said Claudia Vernotti, director of ChinaEU. This generation of fairly young, tech-savvy Chinese travelers want to experience Europe like Europeans, she commented. Chinese overseas travelers has backed one third of the Italian luxury sales and a new trend in the industry is the integration of online and offline strategy to convert digital presence into offline sales. Eduardo Barbaro, Worldwide Omnichannel Director at Bvlgari – one of the most digitally advanced luxury brands in China’s market – said online luxury sales are expected to triple in growth by 2025, with half of e-commerce orders made via mobile, while physical sales will still account for three quarters of total sales. The Italian jewelry brand seeks to provide a unique, personalized, luxury experience to Chinese customers, and WeChat plays an important role in this strategy. The panel discussion was joined by Rodolfo Pegan, community manager at Scooterino, a mobile application that provides its users with on-demand scooter ride sharing services in Rome and other Italian cities. Pegan said Scooterino provides a cashless mobility solution to bypass the often-heavy urban traffic, but also offers tourists a very special and local way to explore Italy. 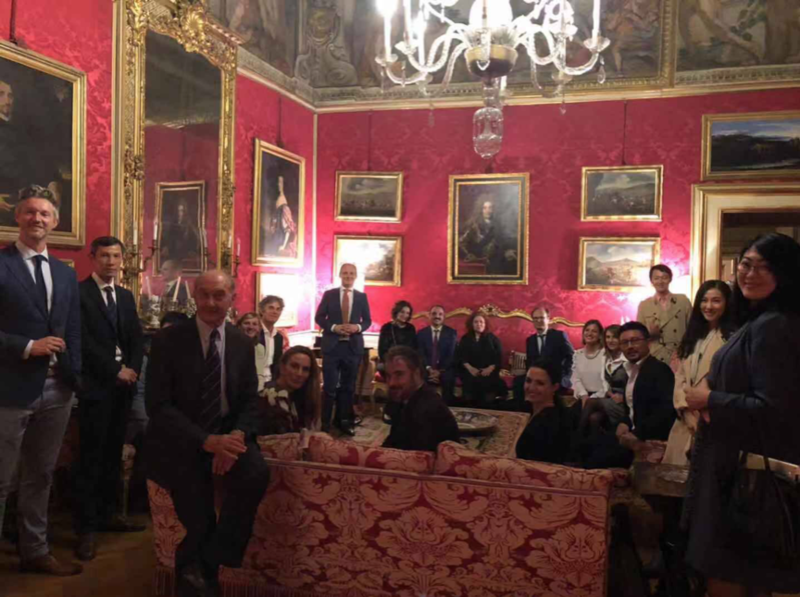 At the end of the event, a number of partners of WeGoEU’s project, was able to test Scooterino’s service, hopping on vespas and scooters to reach a beautiful private palace in the historical center of Rome, were the evening ended with an exclusive tour guided by the very owner of the place. This specific visit is now available to users of WeChat Go Europe mini-program thanks to a partnership with Beyond The Gates, an Italian startup that provides access to unique Italian locations often inaccessible to the public. “Beyond The Gates and Scooterino are just two examples of ‘when in Rome do as the Romans’ experiences that WeChat users can access to, beyond tourist attractions, local food and top shopping destinations,” said Claudia Vernotti.